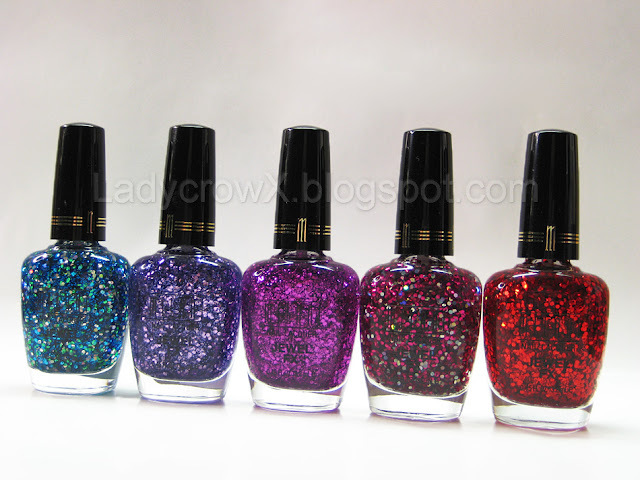 I recently received the Milani Jewel FX Nail Polishes, I was excited when I saw them as I love everything sparkly and shiny! These 5 colors are part of the new colors released for 2012. Bedazzle your nails with Milani’s Jewel FX. These chunky glitters give the impression of the finest jewels adorning your nails. Multi-colored glitter sparkles like gems. Price: $4.99 for NET WT 0.45 FL OZ 13.2 ml on Milani's Website. Pros: You can use one coat or two to add a little or a lot of extra sparkle. DBP, Toluene & Formaldehyde Free, this is a plus for me because I try to stay away from them. The formula is nice and I had no issues applying any of them. The price is nice considering the fact it's possible dupes for the high end brands that cost twice as much. Cons: I didn't find any cons with these nail polishes, all performed well and the effect is gorgeous. Cost: $4.99 each for NET WT 0.45 FL OZ 13.2 ml. Do you own any of these? What do you think? Have a favorite? 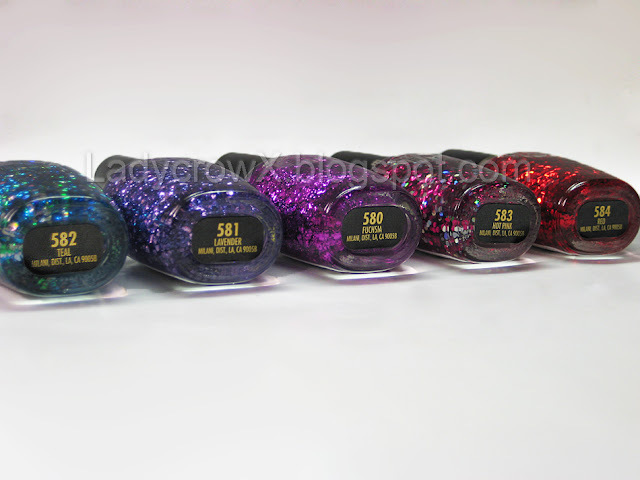 From the swatches, a lot of them look very similar to the Jordana glitters, which are available at Kmart and online. Since Milani and Jordana are owned by the same parent company, I guess it's not surprising. Jordana has Milani beat as far as price $3, but Milani is going to be much more widely available. Ah, I had not realized that there was that much of a size difference. However, I'm in the middle of trying to use up a 4 ml bottle, am 10 uses in and less than halfway through the bottle! I really want Fuchsia and Red! I have the silver one that was already in this collection and love it. I know I will love these as well!